There is now less than one month before school starts, but there are still plenty of fun local family events to enjoy before summer ends! 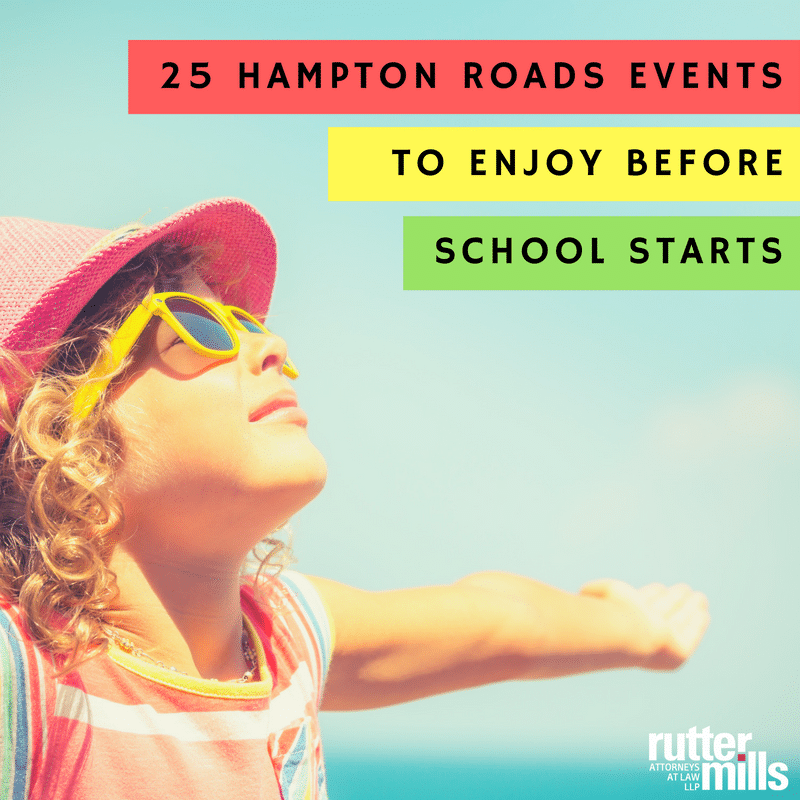 Pack more fun into the rest of your summer with this handy list of events happening this month in Hampton Roads! Have fun, be safe, and remember – we’re here 24/7 if you need us! Located at Town Center Virginia Beach at 201 Market Street, Virginia Beach, VA 23462. Highlights: The eighth annual summer nights at Town Center Concert Series will take place on the Sandler Center Outdoor Plaza. Visitors will enjoy music ranging from rock to blues to Motown. Title sponsor Ynot Italian will be serving up delicious pizza, sandwiches, and gelato. The Virginia Beach Farmers Market will have local farmers with their fresh fruits, vegetables, and other homegrown items on the Plaza. Check out the Kids’ Art Cart inside the Miller Studio Theatre. Free and open to the public. Highlights: The 23rd Annual American Music Festival will feature three major headline bands on the 5th Street Main Stage between Sept. 2-4. 311, Culture Club and UB40 featuring Ali Campbell, Astro and Mickey Virtue will bring a wide spectrum of talent and dozens of hit songs everyone will recognize. See website for schedule of bands and concert locations. Located at Back Bay National Wildlife Refuge at 4005 Sandpiper Road, Virginia Beach, VA 23456. Admission: Entrance fee to get into the Refuge is $5, the event is free. Highlights: Explore Back Bay National Wildlife Refuge through a sea turtle nest recreation, netting activities, crafts, and nature walks! Spots are limited. For ages 6 to 12 years old. Click here or please call 757-301-7329 ext. 3016 to reserve a spot or learn more. Located at Cape Henry Lighthouse at 583 Atlantic Avenue, Virginia Beach, VA 23459. Highlights: Join at the picnic area while exploring the swashbuckling seas and the deepest parts of the ocean! The stories featured in Cape Henry Lighthouse Story Time include The Whale by Cynthia Rylant, The Eagle by Cynthia Rylant, The Turtle by Cynthia Rylant and How I Became a Pirate by Melinda Long and David Shannon. Located at the Francis Land House at 3131 Virginia Beach Blvd, Virginia Beach, VA 23452 and at the Princess Anne County Training School/Union Kempsville High School Museum at 5100 Cleveland Street, Norfolk, VA 23510. Highlights: Get to know the History Museums! At the Francis Land House, enjoy guided tours of historic house, old-school toys and games, and Ye Olde Selfie Station. Bring your picnic and stay all day! At the Princess Anne County Training School/Union Kempsville High School Museum, learn about the struggles faced by local African-American students during segregation and the extraordinary successes they achieved. Friday, August 12, 2016 and Friday, August 26, 2016. Activities begin at 7:00 PM and movies begin at sunset. Located at Mount Trashmore Park at 310 Edwin Drive, Virginia Beach, VA 23452. Highlights: Enjoy a movie under the stars! Bring blankets and beach chairs to get comfortable as you watch these family-favorites on our giant screen. Concessions will be available for purchase. “Home” plays on August 12 and “The Peanuts Movie” plays on August 26. Located at the Virginia Beach Oceanfront 31st Street Stage at 31st Street and Atlantic Avenue, Virginia Beach, VA 23451. Highlights: The Symphony by the Sea is presented by The Breeden Company. This concert is free and open to the public. Each Thursday in August 2016, beginning at 11:00 AM. Located at the American Rover Sailing Cruise at 333 Waterside Drive, Norfolk, VA 23510. Highlights: Looking for something the whole family can do? Try a hands on youth sailing adventure cruise. On board families will have chance to steer the ship and see all the tools the captain uses to navigate. Learn how to tie sailor knots and about the history of ships and sailing! The ship will cruise the smooth waters of the Elizabeth River and Hampton Roads Harbor. Saturday, August 13, 2016 from 8:00 AM until 10:00 AM. Located at the Virginia Zoo in Norfolk at 3500 Granby Street, Norfolk, VA 23504. Admission: $15.00 for Adults (12+ years old), $10.00 for Children (4 to 11 years old), free for children ages 3 and under. Highlights: This event is a rare opportunity to enjoy breakfast at the Zoo and then watch the animals eat their breakfast too! Zoo volunteers will also be at exhibits to dish out interesting animal facts during this once-a-year, exclusive members-only event. Enjoy Train rides and bounce houses for just $1.00, music from the Olde James River Jazz Band, performances from the Hurrah Players, appearances from Tango the Tiger and other mascot friends. Gates open at 7:30 AM, Breakfast begins at 8:00 AM. Admission: Free with regular admission. Highlights: Did you know that the Zoo has kept honey bees for the last 22 years? The Norfolk Beekeepers currently maintain the Zoo’s hives. About 30 pounds of honey are harvested from the hives each year, but their main purpose is education and conservation. Don’t miss the celebration of World Honey Bee Day. Enjoy Garden Tales, crafts, the Norfolk Bee Keepers and their observation hive, conservation buttons and discovery stations! Each Friday in August 2016, from 6:00 PM until 9:00 PM. Located at 700 Town Center Drive, Newport News, VA 23606. Highlights: This free concert series featuring two bands each evening, a dance floor, corn hole, lawn games, free children’s activities, food vendors, and beverage sales. Proceeds benefit Newport News charities. Band schedule is as follows: August 5, 2016 – Wonderland, August 12, 2016 – Seth Stainback & Roosterfoot, August 19, 2016 – Romonta, August 26, 2016 – Slapnation. Admission and parking are free. Each Tuesday, Wednesday and Thursday from August 1, 2016 through August 18, 2016 at 10:00 AM. Located at the Paragon Theater City Center at 11810 Fountain Way, Newport News, VA 23606. Highlights: Enjoy free children’s movies at the Paragon Theater at City Center! Enjoy Ramona and Beezus from August 2 through August 4 and Alvin and the Chipmunks: Road Chip from August 16 through August 18. Each Tuesday in August, 2016 at 2:00 PM. Located at Downing-Gross Community Center at 2410 Wickham Avenue, Newport News, VA 23607. Highlights: Enjoy free movies at the Downing-Gross Community Center! Free admission for children ages 7 to 17 years old. Kids under the age of 11 must be accompanied by an adult or older sibling. Showing calendar: August 2, 2016 – Shaun the Sheep, August 9, 2016 – The Good Dinosaurs, August 16, 2016 – Cinderella (2015), August 23, 2016 – Norm of the North, August 30, 2016 – Zootopia. Each Thursday in August 2016, from 6:00 PM until 10:00 PM. Located at the Mariners’ Museum and Park at 100 Museum Drive, Newport News, VA 23606. Highlights: Bring a blanket and the children as you enjoy live music on a high-rise stage, activities, and several food and beverage options on the front lawn of The Mariners’ Museum. Band schedule is as follows: August 4, 2016 – The Deloreans, August 11, 2016 – Butter, August 18, 2016 – Pop Wire, August 25, 2016 – Hey! Hey! Hooligan. Admission is free and drink tickets are $5.00 each. Located at Slide the City-Hampton at 720 Settlers Landing Road, Hampton, VA 23669. Admission: $13 to $99 per person. Click the link below for details. Highlights: Slide the City is a family friendly slip-and-slide water party event – Fun for all ages! There will be live music, food, drinks, water, and of course the biggest slip and slide ever to hit asphalt. Located at Fenwick and Ingalls Road, Fort Monroe, VA 23651. Admission: $15.00 to $40.00. Click the link below for more information. Registration fee includes T-shirt, snack, ice cream, children’s activities, and chip timing. Highlights: Performances will take place at the Bandstand at Continental Park featuring outstanding regional military bands and area concert bands. All concerts are free and open to the public. Fort Monroe is located just off of I-64, exit 268, Mallory Street exit. Continental Park is located at the intersection of Fenwick and Ingalls Roads. Free bi-weekly concerts will take place every other Thursday evening from 6:00 to 8:00 p.m. beginning through September 01, 2016. This is located at 725 Eden Way North, off Eden Way North and Stephanie Way in the Greenbrier section of Chesapeake. This is held in the grassy area near the center’s gazebo. Relax in the evening air and enjoy listening to some of the area’s best music. A variety of music genres have been chosen so there will be something for everyone. Located at Elizabeth River Boat Landing and Park at 1400 Elizabeth River Way, Chesapeake, VA 23324. Highlights: Featuring the Disney Pixar animated comedy-drama adventure film Inside Out. Before the movie starts, dance the afternoon away with our Astro DJ playing family friendly music. Or visit our information tent and sign up to win prizes while the kids bounce in our large inflatables and the younger ones play in our new and improved “waddler and toddler” area. Other activities include face painting, lawn games, and food vendors. All activities are free! Concessions are on-site for purchase. Please bring your blankets or lawn chairs (allowed in selected seating areas only). No tents permitted. Event opens at 6:00 PM and movie begins at 8:00 PM. Located at Hickory Ruritan Club at 2752 South Battlefield Boulevard, Chesapeake, VA 23322. Highlights: This Tidewater Bluegrass Music Association concert is sure to please! Held at the Hickory Ruritan Club, it features the Rappahannock Crossing band. Suggested Donation – $5.00 for members, $10.00 for non-members. Donations are accepted at the door. Highlights: This is the free “Sunset Thursday’s” concert series at Portside on the waterfront. All performances will take place on Thursday evenings at 6:30 pm – 9pm. Come relax and enjoy great music, food and beverages, while watching the stunning sunset overlooking the Elizabeth River. There will be no rain dates, if the event is canceled due to inclement weather, it will not be rescheduled. For more information please call 757-393-5111. Highlights: Free and open to the public. Movies include The Sponge Bob Movie, Inside Out and The Game Plan. Held at Portsmouth City Park: 7 CPL. J.L. Williams Avenue, Portsmouth, VA.
Each Wednesday in August, 2016 from 7:00 PM until 9:00 PM. Located at Merchants Square at Duke of Gloucester Street, Williamsburg, VA 23185. Highlights: The Summer Breeze outdoor concert series is in Merchants Square’s beautiful Duke of Gloucester Street for the 25th year. The Summer Breeze Concert Series are FREE concerts held on Wednesday evenings outside in Merchants Square starting at 7:00 PM. Bring the kids early because face painting starts at 6:30 PM! All concerts are free, and concertgoers are advised to bring a lawn chair. Band schedule: August 3, 2016 – United States Air Force Rhythm in Blue Jazz Ensemble, August 10, 2016 – United States Army Training & Doctrine Command Band, August 17, 2016 – United States Air Force Blue Aces Pop Ensemble, August 24, 2016 – United States Air Force Heritage Brass Ensemble, August 31, 2016 – United States Army Training & Doctrine Command Band. Located at Bennett’s Creek Park at 3000 Bennett’s Creek Park Road, Suffolk, VA 23435. Highlights: Enjoy this free and family-friendly event in the park, as different bands play a variety of hits and kids enjoy the children’s area! Cheap Thrills plays on August 5, 2016, The Tidewater Drive Band plays on August 12, 2016, Popwire plays on August 19, 2016. Located at the Great Dismal Swamp National Wildlife Refuge at 3100 Desert Road, Suffolk, VA 23434. Admission: $10.00 for adults; $8.00 for seniors (60+), military, and children ages 3 to 12 years old. Highlights: This narrated Swamp Safari, one of Suffolk’s most popular attractions, fills up quickly. This four-hour tour is led by a biologist specializing is the unique habitat of the Great Dismal. Learn about the history, lore, vegetation and wildlife with this adventure that includes a brief walk to Lake Drummond. Sunscreen, insect repellent, comfortable clothes and shoes are recommended. A small snack and beverage are provided. This tour is not recommended for very small children. Reservations are required and cancellations are expected no less than 48 hours prior to scheduled tour. Call the Suffolk Visitor Center at 757.514.4130 to reserve your spot. Located at the Suffolk Center for Cultural Arts at 110 Finney Avenue, Suffolk, VA 23434. Highlights: Join the Suffolk Division of Tourism for a free mystery movie, Disney’s Zootopia. From the largest elephant to the smallest shrew, the city of Zootopia is a mammal metropolis where various animals live and thrive. This PG-rated movie has a running time of 108 minutes and features the vocal talents of Jason Bateman, Ginnifer Goodwin, Idris Elba, Octavia Spencer, Shakira, and many more!